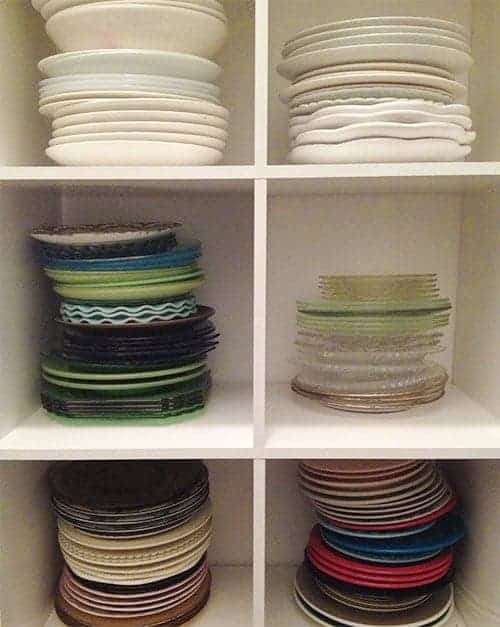 When we moved into our new home in June I had no idea where all my side plates and cutting boards and cake stands would go. My dream would be that they are all out and accessible, but the reality was that many would have to be stored in boxes and in closets. 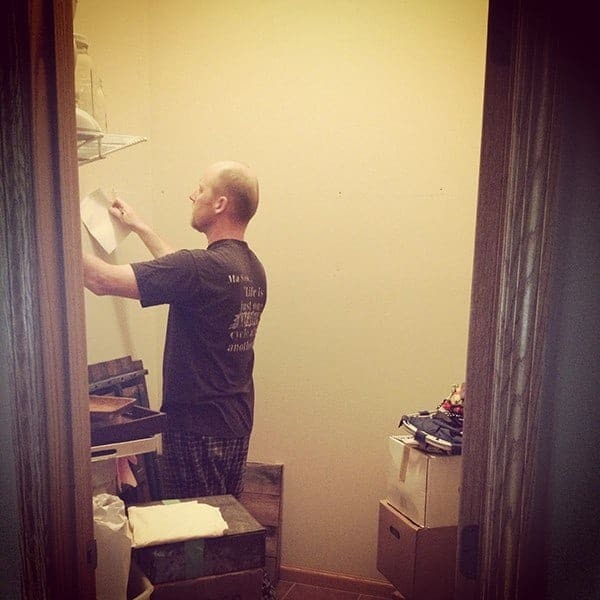 But then my amazing husband came up with the idea of utilizing a large closet just off the kitchen. So he got out his tools and measured and shopped for supplies. He was going to make my dreams come true! Is that weird? 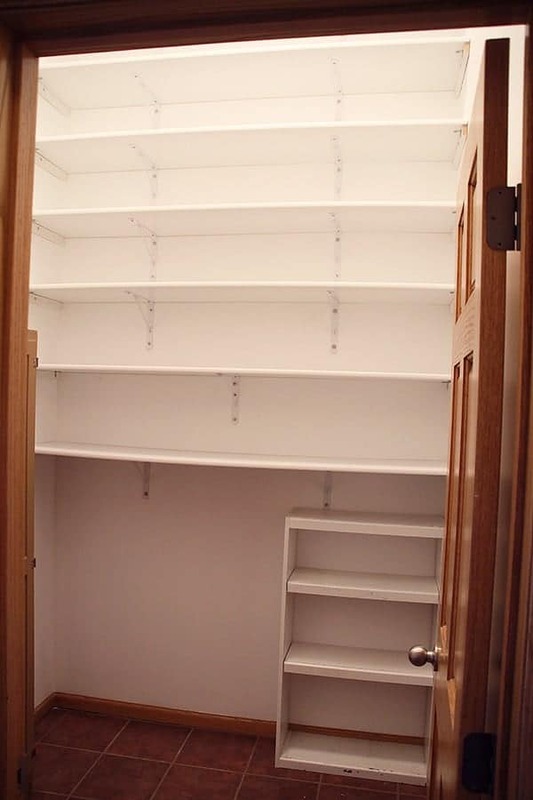 That I dream of prop closets? And he built me shelves all the way up a 13 foot wall. All. The. Way. Up. He built them, and then he left for a week long fishing trip to Canada. Trust me, he earned it. Did I mention that wall is 13 feet high? 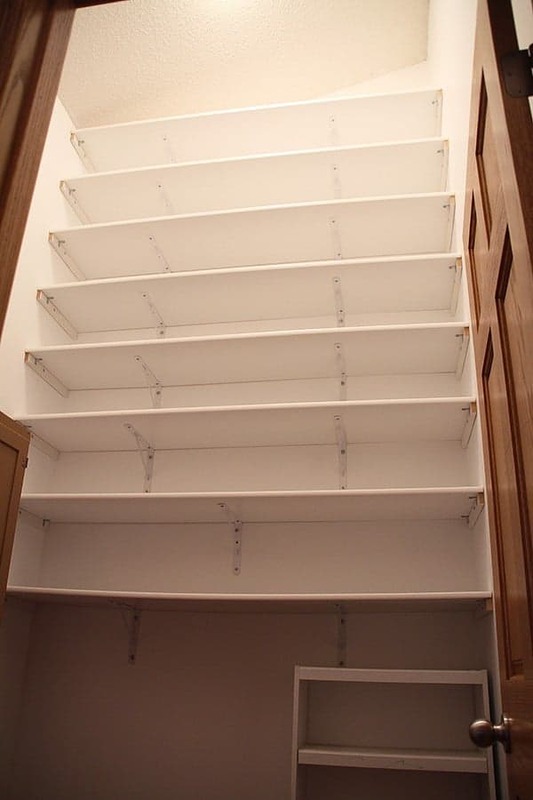 Do you want to know how I even get all the stands on the shelves? Well, like pimpin’, it aint easy. I used this handy dandy ladder which has now found a home in that closet. Not only did I have enough to fill that wall, I may even have to get rid of some of the stands to make my favorites fit. We are looking into CakeStandAddiction programs. As any food blogger knows, you have to have backgrounds and side plates and silverware… so all that fun stuff has made its home here as well. 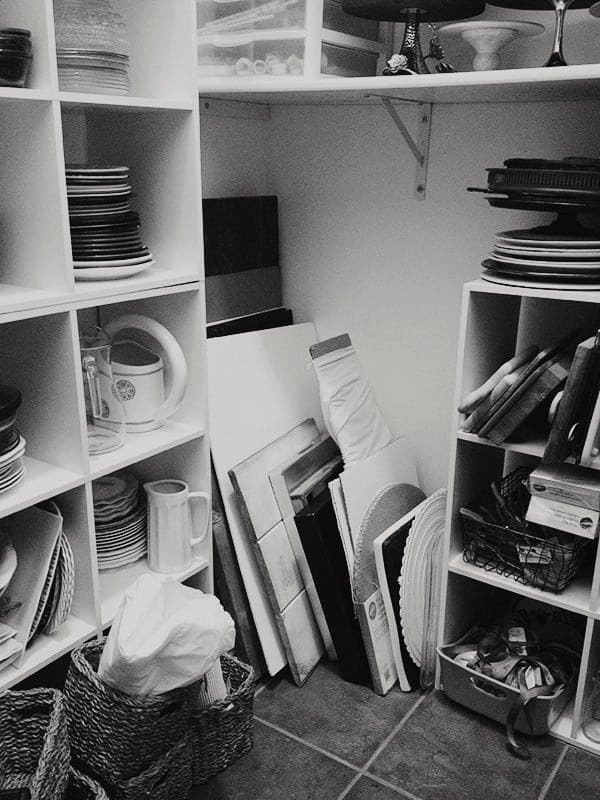 In our previous home everything was scattered throughout the house and garage and I never knew how much “stuff” had accumulated. One time I went in there and just hung out. I am considering getting a Keurig, a comfy chair, and a little shelf for my computer. So I can spend all my working hours in a tiny little room full of stuff. That wouldnt be weird right? 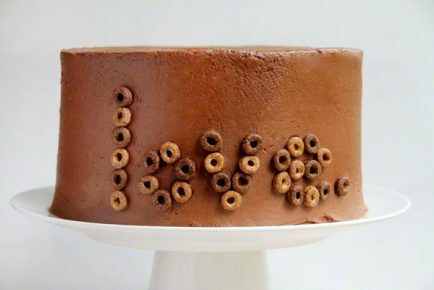 ** You can see many of the cake stands in my new book, Surprise-Inside Cakes. I purchased quite a few JUST for the book and never shared them on my blog! Buy the book here! I NEED a closet like this in my life! 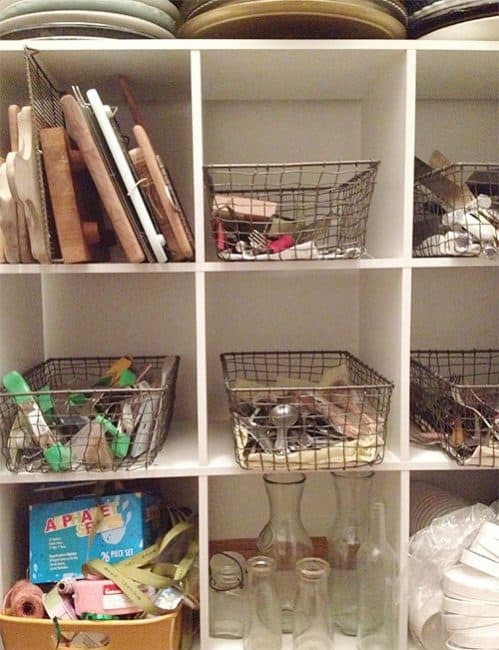 Look at all that organization! Also, I didn’t even know there were that many different cake stands. I have never had good luck finding cake stands that are much of anything to look at (in fact, the last time I needed one I made it myself by gluing together a candle stick holder and a salad plate, then spray painting the whole thing). 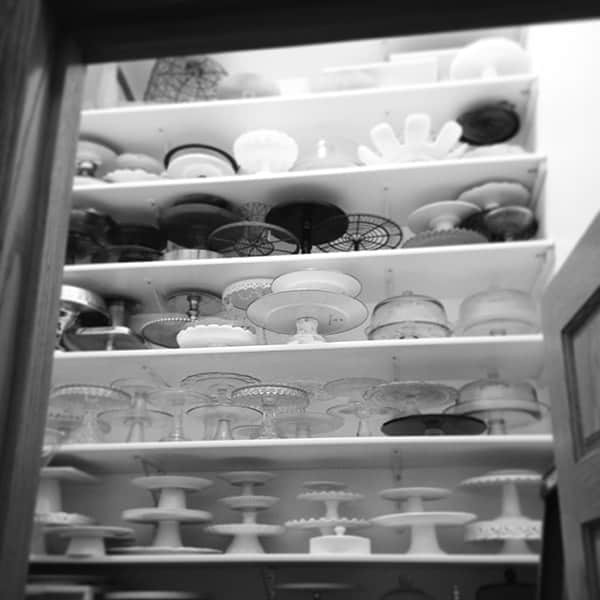 Is there a secret cake stand warehouse (besides your new closet) that I’m not aware of? If so, I need to go there! Oh, this just cracks me up!!!! I read it to my husband when he got up this morning as I had just finished reading it myself. I identify with you so much……….as I have just as many. I have a room with bakers racks dedicated to them. I love each of them and use them all the time. They do not sit on my shelves! Love your stacking ability to fit tham all in there! Looks like something I would do! I have a whole bedroom that I put all my caking supplies in and my husband keeps asking when I’m going to turn it back into a bedroom for guests to stay in. I still haven’t given him an answer….. Thank you for sharing . All of the stands are unique and lovely. I looking at cake stands & all the possibilities but then I think what about the leftover cake & how am I going to cover it on the beautiful cake stand? What do you do? 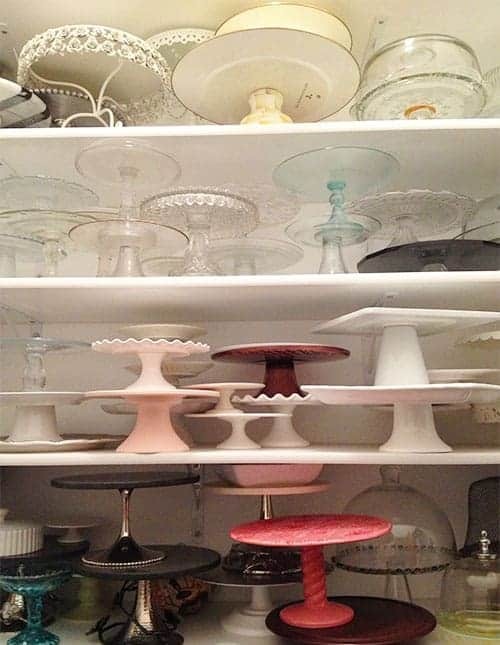 I love your cake stand closet. I have one cake stand. it is milk glass green and was sold my Martha Stewart in her online shop prior to her being incarcerated. I loved that store. I am not sure of the name of the company who made the stand, but I also have a small two piece easter hen. I find this milk green glass goes with pretty well every colour of cake. I am very protective of it as so many people have coveted it!!!! Hi Amanda! I have stopped drooling over your collection so now I would like to say what a splendid job of organizing all those gems! I have always had a fascination with footed cake stands, as well as most things sparkly and shiny. I am feeling quite comfortable now with what I thought was too many, about 10. Thank you for that. Love the photos of your ‘room’ It definitely needs a Keurig and a chair! 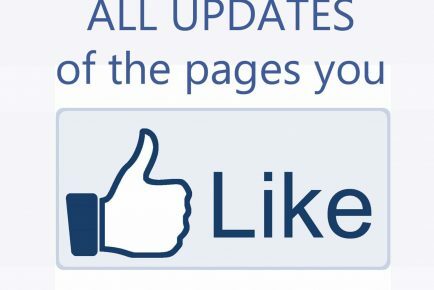 Thanks for the rest of your posts as well! Oh, oh, OH! 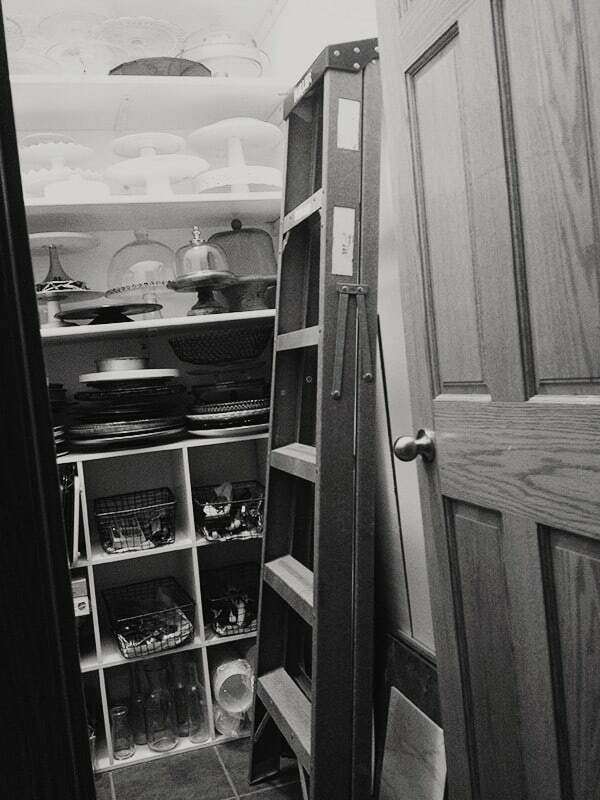 That cake stand closet is THE absolute BOMB!